I knew very little about Earthships until I visited the Earthship Nicaragua building site outside of San Juan del Sur yesterday. 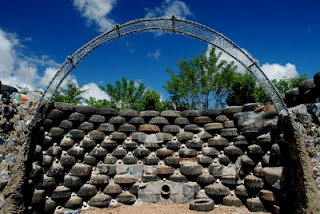 Dave Kniffen of Earthship Biotecture is heading up this latest project to build houses out of used tires. The plan is to have this house built in 16 days. The idea of sustainable construction is not new. But I believe it is even more important in todays world of limited and endangered almost-everythings. There are lots of very interesting people working on the project as well. It takes a very special kind of person to volunteer to work in another country in the heat to help teach others something new. The human spirit is alive and well in our world. It shows in projects like this. Uhm... suggest this to WebUrbanists... and visit their site.